WERNER AISSLINGER is a multi award-winning designer. His “July Chair” is on show at the MoMA, while his Studio Aisslinger has offices in both Berlin and Singapore. Moreover his design office’s works are currently the subject of an entire museum exhibition: Werner Aisslinger and his team are showing their objects – including a KALDEWEI bathtub – at the Pinakothek der Moderne in Munich under the title “House of Wonders”. 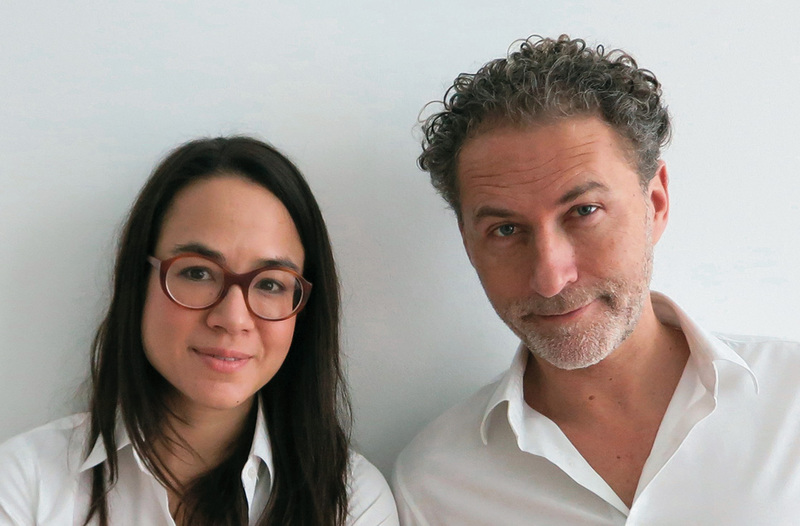 MR. AISSLINGER, TOGETHER WITH TINA BUNYAPRASIT, YOU HAVE JUST DESIGNED YOUR FIRST BATHROOM COLLECTION FOR KALDEWEI. DO YOU ENJOY WORKING IN UNFAMILIAR TERRITORY? W. Aisslinger: Our design office is at home in many different worlds. We are accustomed to constantly feeling our way creatively into new contexts and because we handle a great many major interior design projects such as hotels, malls or cruise ships, designing bathrooms is a familiar area for us. WHAT IS SPECIAL ABOUT DESIGNING BATHROOM OBJECTS? W. Aisslinger: Bathrooms are currently undergoing a rapid evolution and, apart from the fact that for some time they have been getting bigger, more homely and more wellness-oriented, in future they will also be the only places in the home where daily rituals are more important than the increasingly omnipresent digital world which is gaining a foothold in every area of life. For designers this means creating a place of wellbeing that will become increasingly more colourful, material-oriented, more unconventional and more imaginative. WHAT WAS THE GREATEST CHALLENGE IN DESIGNING THE OBJECTS? W. Aisslinger: Taking another step forward with KALDEWEI and being the first manufacturer to test rimlessness with regard to steel enamel. 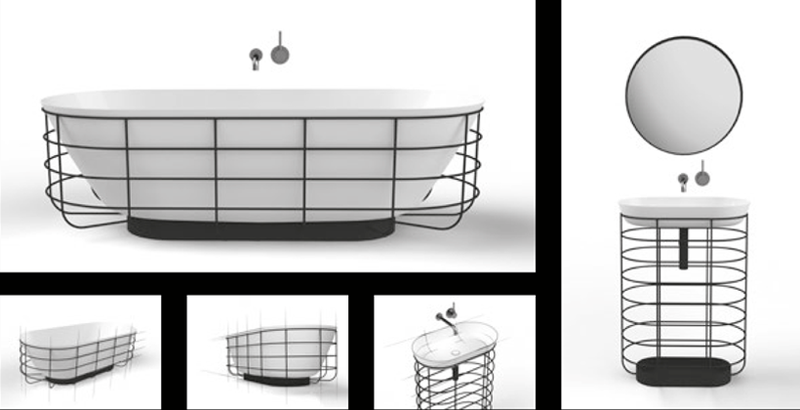 Then there was the question of how the pure single-shell bathtubs could be interpreted within the given space in a completely new way and integrated into different architectures. The result was TRICOLORE and GRID whose concepts offer a new connection with the surrounding architecture and allow bathtub and washbasin, like freestanding pieces of furniture, to assume sculptural yet functional structures. LIKE THE BATHROOM OF THE FUTURE. Werner Aisslinger & Tina Bunyaprasit. TRICOLORE explores no fewer than two new themes. On the one hand, the mainly monochrome white bathroom world is completely revolutionised through the addition of colour. On the other hand, the bathtub puts an entirely new interpretation on the historical archetype of the freestanding lion claw tub. Think collage! The bathtub is enamelled in two colours; the third colour comes from the frame whose wraparound band appears to have been cut out of a different bathtub. The hallmark of the GRID concept is the way surfaces and volumes are dissolved in favour of an open framework structure. 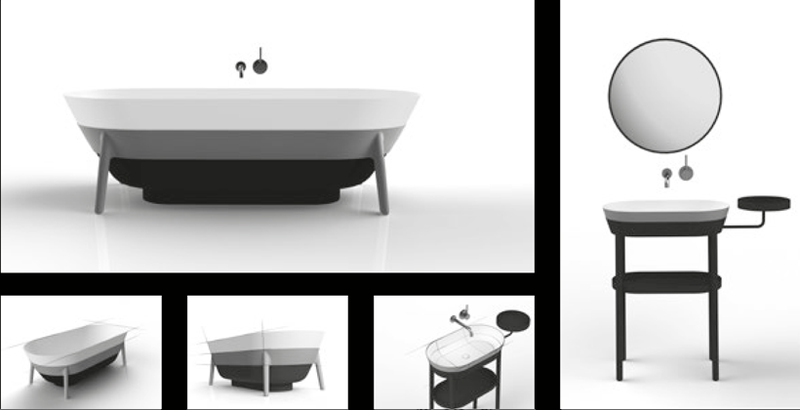 The single-walled and thus weightless-looking washbasin and bathtub seem to float and are visible as outlines. The grid structure contains not only the washbasin and bathtub but can also integrate products and accessories or plants that can be inserted into it, collage-style.